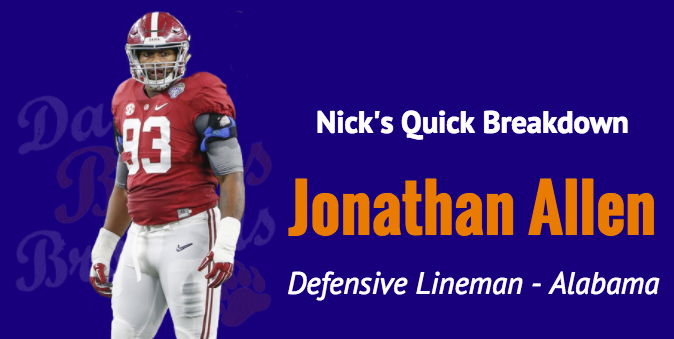 In last week’s Twitter vote I may have swayed it by telling you guys that I wanted to break down Alabama defensive lineman Jonathan Allen … I’m glad I did. Alright guys, who do you want @NicholasMoreano to breakdown next? He is hoping you pick Allen, lots of experts have the #Bears drafting him. Just looking at his accolades, I was convinced that I wanted the Bears to draft him with their first-round pick. After taking an in-depth look at his game, I’m completely sold that he is the perfect fit for the Bears’ defense. Drafting Allen would give defensive coordinator Vic Fangio a versatile player, who can line up anywhere along the line. He possesses the strength and athletic ability to take advantage of one-on-one matchups and uses his quick hands to get offensive linemen away from his body. Fangio should be demanding that general manager Ryan Pace and head coach John Fox draft his new starting defensive end opposite of snubbed Pro Bowler Akiem Hicks. Imagine Hicks, Eddie Goldman and Allen on the line … That would strike fear into all opposing offenses. Speaking of fear, I tell you all about what opposing offenses are going to have to worry about this upcoming season in the video below in which I broke down three games from Allen’s 2016 season. After watching the video, look at these examples below that showcase Allen’s skillset and reinforce what I said. On this play against USC, Allen is lined up at the top of the screen. Like I said in the video, he abuses offensive lineman who like to play overaggressive. The offensive tackle lowers his head and Allen uses his quick hands to shove him aside and gets into the backfield to minimize the gain. In the playoff game against Washington, Allen uses his football intelligence to make an outstanding play. He recognizes that the offensive lineman he is lined up against isn’t fully engaged with his block, and knows a screen play is coming to his left. He follows the quarterback’s eyes and tackles the running back for a loss. Allen always finds himself at the right place at the right time. Against Texas A&M, linebacker Ryan Anderson gets in the backfield and causes a fumble. The 291-pound lineman is there to pick up the football and takes it 31 yards for the touchdown. Finally, here is the play that made me move back in my seat and left me in awe. Against Texas A&M, Allen is lined up over the guard and uses those quick hands to move him aside. There is a running back there to help block, but Allen dives right over him to make a spectacular play. Opposing offenses will have to send double-teams his way and that will open up opportunities for his teammates. If Allen is there when the Bears are on the clock, there is no way they can pass him up.